Hey everyone. One week and counting. The Auburn Tigers will be on the field for real this time next Saturday. The team is taking today off. Practice resumes Sunday afternoon. As you'd expect, I'll be there to snag all the important information. Thanks for visiting the HOTTEST Auburn blog on the 'net. We're happy you're here. This is my projected offensive depth chart. The official depth chart will be released in a few days. Let's see how close I am. Hey everyone. Auburn has finished its Friday practice. I made a careful decision to miss the workout because, well, it ended up being less significant than advertised. Ninety minutes. Shorts and helmets. The focus was on special-teams stuff. No non-scrimmage scrimmage. Auburn picked up its ninth commitment of the 2008 signing class today. TB Reggie Hunt, a 5-10 kid from Daphne, said he's planning to play for the Tigers. He had scholarship offers from a variety of schools. The finalists were Auburn and West Virginia. Answer: Absolutely. I think he has Auburn's best set of hands. Well, Slaughter and Ben Tate are there together. Slaughter is behind, we've all read that 5,000,000 times in two weeks, but they're devise some method to give him a substantive role of some kind. Why don't the coaches some up with some Tim Tebow-type role for Kodi Burns? Answer: Coaches keep saying they won't do that. I believe them now. I didn't initially. Remember that Tebow graduated early from high school and went through spring drills in 2006. Burns didn't. Will Kodi Burns play this season? Blake Field is the backup. He'll take over if Cox suffers a minor injury. A stubbed toe. Shin splints. If Cox suffers a more serious physical setback, I fully expect to see Burns take over. That serves two functions: It gives Burns a chance to make rapid improvement. It also give coaches an alibi for a team-wide meltdown. If Cox was to go down with a major injury, Auburn is going to be compromised severely. Why burn that development time on Field when, at best, he'll be a one-year starter? Coaches can play Burns, marvel at his good plays, laugh about his bad ones and cite Cox's injury for the team's problems. Cox is the team's most important player. You know that. I know that. Without him, this thing could sink. This doesn't count as Auburn hotness, but this was funny. Us beat writers received an email today from Kansas State's publicist, former Auburn SID apprentice Kenny Lannou, that noted KSU coach Ron Prince won't be available for phone interviews. He spends up to one hour per week to talk with out-of-town media. He's already looking at a full schedule. Here's the problem: None of the Auburn writers have scheduled interviews. So who's going to be on the horn during the out-of-town hour? The London Telegraph? Hey everyone. Practice has ended. They went around two hours this morning, which is a lot considering yesterday's practice ended around 7 p.m. That's a quick turnaround. Not a lot going on today. Check below for some morsels of goodness here at the HOTTEST Auburn blog on the 'net. The biggest news today, I suppose, was the full-speed return of TB Mario Fannin. The redshirt freshman has been held out of the most rigorous drills because of a sore groin. Sounds like he's over that. Fellow TB Carl Stewart (hamstring) said his role in practice expanded on Thursday. He claims to have "snuck into" some contact drills before getting pulled out. The Tigers spent approximately half of today's practice working against the scout teams. Preparations for Kansas State have commenced in earnest now. Tommy Tuberville heaped glowing praise on KSU, saying it'll be one of the better teams Auburn plays all year. Tuberville said the team will hold a short non-scrimmage scrimmage on Friday night. It'll be like what happened Wednesday night -- scripted plays and no tackling. The offensive and defensive lines still are trying to get their rotations set. Coaches involved with those positions will be monitoring play along the lines tomorrow. Was he jinxed? LB Brent Slusher, Advertiser cover boy, missed practice Thursday because of a sprained right wrist. It was bandaged last night. I didn't mention it here or in the Advertiser because Slush promised me that it wasn't serious enough to note. Now Tuberville says Slush was out today and may not be ready on Sunday. Oh well. Bo Harris is back. I like to talk junk to Cox because our lockers are right across from each other. When we walked downstairs, I was like: `Cox you better be happy I'm on your team.' He was like yeah, I would be scared of you if you were on another team. He was being sarcastic. Hey everyone. OK. OK. I was a little slow getting this updated after practice but I have a good excuse. I pieced together a sure-to-be-award-winning story about Brent Slusher for Thursday's paper. That took a little longer than expected. Still, I'm here with fresh practice information. Check below for the new stuff. As for the picture, you might ask: Why Brandon Cox? This is my small tribute to him not being named to the Davey O'Brien watch list, which included real stars like Rice's Chase Clement, UNLV's Rocky Hinds, Kinsmon Lancaster from UL-Monroe and Justin Willis from SMU. I'm sure Cox is devastated. Auburn held an 80-play scrimmage at the end of Wednesday's practice. Cox said the emphasis was on learning to substitute personnel groupings quickly and managing the clock. He said all plays were scripted. Tailbacks couldn't be tackled. You get the picture: Not much of a scrimmage at all. I know that CB Jerraud Powers picked off a Cox pass that CB Jae Wilhite said probably went for a touchdown. That's as exact as it gets. The press isn't allowed to watch practice these days. Talking with LB Brent Slusher is an interesting enterprise. He's quiet and shy and remarkably humble. He's also the No. 2 guy behind Craig Stevens. Bo Harris (shoulder) was back on Wednesday, though, which may shuffle Slusher back into the No. 3 hole. Who knows? Harris is a freshman -- just like Slush. Harris missed a week with that shoulder. 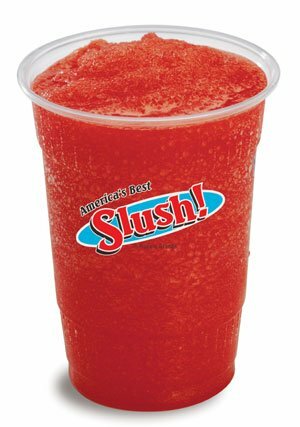 I don't know that he's a lot better than Slush. Auburn fans better hope Stevens stays healthy. Here's a shocker -- Blake Field has been named the team's backup quarterback. I don't think we've heard the last of freshman Kodi Burns' 2007 season just yet. If Cox is seriously injured at some point this season, I think Burns will be the next in line. If Cox stubs a toe or misses time with shin splints, then Field will get a shot. See what I'm saying there? They're the ultimate test for us because they've got a really good defensive line, really well coached. They'll test you with pass-rushing and run-stopping. I've been very impressed with our coverage, particularly in terms of the corners. We've got a couple kids back there that really make it tough. They're good bump-and-run corners, and they don't play off. It's interesting to me how many defensive players praise LB Courtney Harden's understanding of the defense. I mean everyone loves this kid's head for the game. Linebackers coach James Willis, in a proud tone, said the other day that Harden can play all three linebacker spots. So why is Harden stuck being Merrill Johnson on the weak side? Coaches want to see more aggression from Harden on the field. If you're a faithful message-board reader, you probably recall a recent picture of TB Tristan Davis' toe that made the rounds. It looked terrible -- all bruised and gnarly -- because it was a broken toe. That's what they look like sometimes. Davis was surprised to find that his right foot had become a hot viewing commodity. "How it happened, I don't know. It was kind of weird. I sent the picture to my cousin, and he had a mobile upload to my account or whatever and he was trying to send it to my aunt. (He) sent it to everybody on the list. I got calls like, 'Ooh, what's wrong with your toe.' It was kind of weird having my toe across the world." Jerry Hinnen, the entertaining writer behind Joe Cribbs Car Wash, argued somewhat recently that Tommy Tuberville's best coaching job came during the 2004 season. It's a reasonable position because that team didn't have a weakness and beat good opponents in a variety of ways. Still, I consider 2006 to be Tuberville's best work. Hinnen, with a big assist from Phil Steele, points out how ineffective the offense was. There were other statistical problems with that team as well. You don't need numbers to see that team was mediocre at best. Yet it won 11 games. The bottom line is that coaching staff, Al Borges and Hugh Nall in particular, dramatically adjusted things to deal with Cox's situation. I think devising ways to make the '06 team maximize its ability was more difficult than for a fully healthy '04 team. I realize we're splitting hairs here. That's the fun part of blogs. Weeeeee. Hey everyone. Practice has ended. The big news, if you want to call it that, is signee Nick Fairley has been ruled academically ineligible. Coach Tommy Tuberville said Fairley will enroll at Copiah-Lincoln (Miss.) Junior College this fall. Fairley was one of the two Mobile-area kids implicated in a grade-changing operation during the summer. The other player, cornerback Ryan Williams, was cleared by the NCAA before fall practice began. Two other players with Auburn ties, 2007 signee Wifred Journet and '06 signee Raven Gray, also play at Copiah-Lincoln. WR Robert Dunn: Looks quicker to me. He hit the peak of his jumps more quickly. His routes look sharper. He gets open more often. His hands are a step below Rod Smith and Chris Slaughter, but that's not a problem per se. Dunn looks like a break-out guy at slot receiver right now. He'll make an impact. Don't look for true stardom, though, because slot receivers aren't focal points in Al Borges' offense. RT Lee Ziemba: He looks like a first-team guy right now, which is amazing considering he's 18. He has a decent idea of how to use his feet. He's strong enough. He's mean enough on the field. Once he learns to be patient on pass protections, Ziemba will be a consistent asset. He's already a good run blocker. LB Craig Stevens: He's been shifted from the weak side to the strong side, which is such a different set of responsbilities. Stevens' goal now is to shed blocks and funnel running plays toward the middle of the line. His long arms provide a useful advantage. I attended all but one of Auburn's first 20 practices and I never heard a coach yell at Stevens. That tells me he's in position and handling business. CB Jerraud Powers: I wasn't sold on him initially because he's 5-foot-9 or so. Powers' value is undeniable now. He's an outstanding cover man who rarely gets out of position. His jumping ability and acceleration aren't notable, but he knows how to use the skills he has. Lack of concentration never is an issue. I look at Powers as the new Karibi Dede -- a guy who can think along with an offense and help teammates do the same in real-time. He's very valuable. WR Chris Slaughter: I know. You've read a ton about him already and, at least officially, he may not play. I don't buy it. Slaughter has outstanding hands, perhaps the team's best. Personality may be an issue with him. Slaughter admits to being a disrespectful guy while in high school and I can see that in him. Yet his year at military school amended many of those habits. I think he expects to be the best player on the field. Some likely interpret that as bravado. I think that's just who he is. I believe he'll turn that energy toward self-development and emerge as an excellent receiver. His time will be sooner rather than later. Auburn sort of will hold a scrimmage on Wednesday afternoon. Tuberville said the only thing different will be a no-hit edict on the tailbacks. 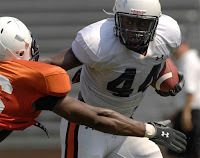 With Carl Stewart (hamstring) and Mario Fannin (groin) ailing, the Tigers need to preserve their two healthy tailbacks. Brad Lester and Ben Tate currently aren't reporting any physical problems. Maybe it was the newspaper jinx. Kicker Wes Byrum missed the hit-or-run attempt during practice Tuesday -- a day after making headlines for winning the job. The shank earned extra running for the whole team. Until then, Byrum had performed admirably in "pressure" situations. TE Tommy Trott said Auburn has made major changes to the tight-end sets this season. Offensive coordinator Al Borges has expanded the number of plays associated with the team's three-tight sets, which was a goal-line exclusive last season. Not now. It's a regular set now. I don't know if this optimism will translate into more catches at tight end, but Trott sure is excited about it. Defensive coordinator Will Muschamp bristled at a question today about LB Tray Blackmon's relatively small size. The sophomore is listed at 6 feet and 225 pounds. "I think that's a position where you have to have great instincts," Muschamp said. ``Zach Thomas was 5-9, 230 pounds and he had great, great instincts. He saw it before it happened. I wasn't ever around Sam Mills, but they said the same thing. People want to harp on size. At that position, to me, as important a quality as anything is instincts – guys that find the ball, field blocks, see blocks, see the carrier, understand the counter. Those are the guys that play that position well. Regardless of size or speed, they see it before it happens and it's hard to coach that. It's an innate ability." Hey everyone. Auburn is taking today off. The team is beginning its regular game-week schedule. Mondays are off. Tuesdays are early. Afternoon practices on Wednesday and Thursday. Friday is usually a walk-through day, but the Tigers probably will run a standard practice this time. Saturday off. Abbreviated practice on Sunday. Rinse and repeat. I'll check back if news develops. Thanks for visiting the HOTTEST Auburn blog on the 'net. I think it's worth noting that single-game tickets to most home games remain available. I put together a fake order for the Vanderbilt game yesterday just to see what I could get. The seats were in the upper deck, sure, but it's two weeks before the season starts! Tickets are $45 each. Every home date aside from Alabama is available. Hey everyone. Today's practice has ended after 20 periods (100 minutes). Tommy Tuberville announced that redshirt freshman Ryan Shoemaker is the top punter and true freshman Wes Byrum will the placekicker and kickoff guy. I can't say either one is a big surprise. Shoemaker missed some time with a groin injury, which led Tuberville to say that Shoemaker was out of the running. Oops. I guess he's back. Check below for more Auburn information on the internet's HOTTEST Auburn blog. Depth charts at PR and KOR seem to be set. Tristan Davis, if you'll recall, is supposed to be the KOR ace but he's out another month with a broken foot. Assistant coach eddie Gran was enthusiastic about how the return teams performed during Sunday's practice - a big change from Saturday. **Fannin is dealing with a relatively minor groin injury right now. Auburn began preparations for Kansas State today, which was earlier than expected. Tuberville initially said that stuff would begin on Tuesday. The team broke into a 30-minute period with the scouts today, though. Freshman Kodi Burns and Steven Ensminger were the scout-team quarterbacks. Tuberville was quick to point out that Burns will alternate between the varsity and the scouts. Coaches believe Burns is a good facsimile of KSU quarterback Josh Freeman. Tuberville said freshman Ryan Pugh will be the second-team center this season. The coach believes Pugh is perhaps the most game-ready freshman the team has. Pugh doesn't get the exposure because starter Jason Bosley is such a respected starter, but it's obvious that the kid has a bright future at Auburn.